This Robot Comedian Is No Louis C.K. Computers trounce people at milking cows, building cars and winning "Jeopardy!" But there are some jobs better left to flesh-and-blood humans. 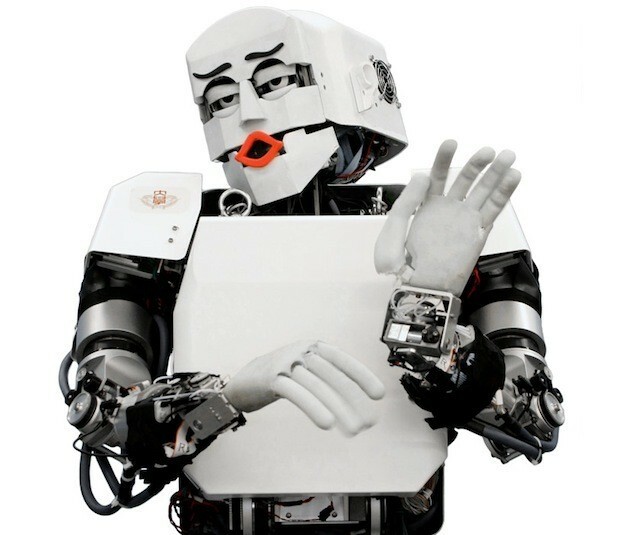 Case in point: Kobian, the robot comedian developed by researchers at Waseda University in Japan. This jokster 'bot isn’t so much funny as it is creepy. Oh stop! ... No, seriously, stop. You're freaking us out. Last week at the IEEE International Conference on Robotics and Automation, held in Hong Kong, researchers presented their methods for teaching the robot how to be a comedian. After studying an array of comedic methods, the researchers found three common themes for making people laugh: funny behavior (dirty jokes, parodies, exaggerations), funny characteristics (self-deprecating humor and imitation) and funny context (repetitive stories, unexpected behavior). In the video featured above, Kobian performs four skits employing those tactics. The performance was shown to have a positive impact on an audience group monitored by researchers. "The routine was also found to have an improving effect on the volunteers' moods," CNET reports. "Before and after viewing the show, they were asked to take a profile of mood states test, which showed slightly decreased levels of stress, depression, anger, fatigue, activity and confusion after watching Kobian perform." While researchers may have nailed down the formula for funny, it sure as hell looks disturbing coming from a robot. A lot of the humor may also be lost in translation, since a majority of the robot's schtick revolves around poking fun at aspects of Japanese culture. Next up, the researchers will be working on a more complex routine for Kobian to perform and test out on a larger audience. For now, though, we prefer a living, breathing comedian. It's one thing when a robot jokingly explains obvious exercises for incredibly lazy people; but there's nothing like witnessing a balding, out-of-shape man attempting to tie his shoe. In our opinion, Louis beats a robot any day of the week.